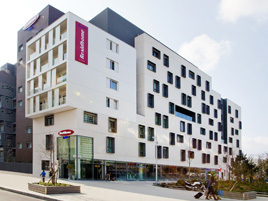 The Residhome Paris Issy-les-Moulineaux serviced residence offers ready-to-live-in apartments and personalized hotel services in a warm and elegant setting. Located in Bords-de-Seine, a new eco-neghborhood, this luxury residence is just a few minutes from central Paris by tram or RER train. You can easily reach the Parc des Expositions de la Porte de Versailles convention center and enjoy exhibitions, performances, and trade and consumer shows all year round. Open 24 hours a day, the serviced residence (low energy consumption building) is made up of 175 apartments equipped with an underfloor heating and cooling system, ranging from studios to one-bedroom units. Designed in a chic and cosy style, each apartment includes a living room, a fully-equipped kitchen (microwave, fridge, glass-ceramic cooktop, and dishwasher), a bathroom, an office area, and an LCD TV with cable and satellite. You will appreciate the complimentary amenities and services available to you such as a fitness room and internet access (Wi-Fi connection). Many additional services, available for an extra charge, will make your stay a smooth one: breakfast, laundry facilities, parking, bar, mini market, etc.